This manual was reconstructed from a photocopy BSA workshop manual using scanning and OCR (Optical Character Recognition) software to transfer the text and images into a word processing program. The layout and chapter structure was then modified to suit modern documentation style before final proof reading was carried out. The photocopy manual appears to be made up of a compilation of BSA service sheets and other contemporary resources. 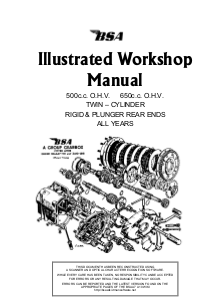 A PDF version of this manual is freely available to subscribers to this WIKI. the original mediawiki software version that powered this site has become obsolete. Look out for further improvements coming soon!! Subscribers can now show-off their bikes on the Subscribers bikes page. An on-line version of each chapter is now freely available. Use the Chapter List to find the topic you need or browse using the next and previous chapter links provided at the top and bottom of each chapter page. The WIKI will initially comprise a page for each chapter of the Manual. the article page will contain an online version of the current published version of the chapter and notes about any planned or confirmed amendments to the next published version.